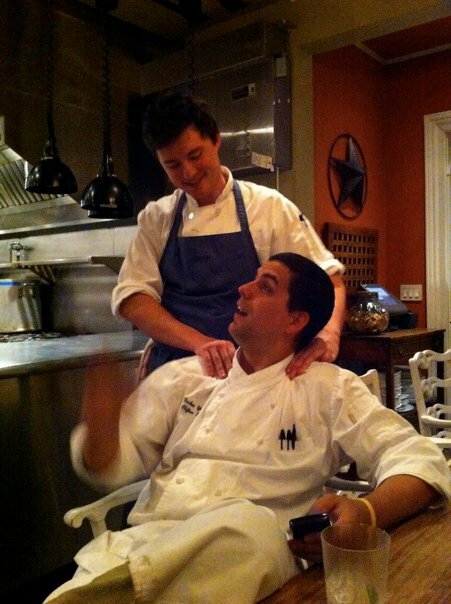 Tyler Teass, standing, with Chef Tucker Yoder. 1) Nugget’s Raw Kombucha at City Market. I love all fermented foods, and all of their flavors of kombucha are really tasty. 2) Cocktails at 9 1/2 Speakeasy. It’s got great cocktails, and they keep it quiet. It’s a great place for after work drinks or dates. 3) Vegetable Soup with Bread and Butter on the late night menu at C&O. Delicious and hits the spot especially now since the weather’s gotten colder. Plus, they play great music. 4) Duet of Lamb “Greek Style” at Ivy Inn. Angelo is the nicest guy ever and makes awesome food. His gyros are worth the trip to Ivy alone. 5) Larb at Thai Siam. It’s one of a kind and I constantly crave their food.